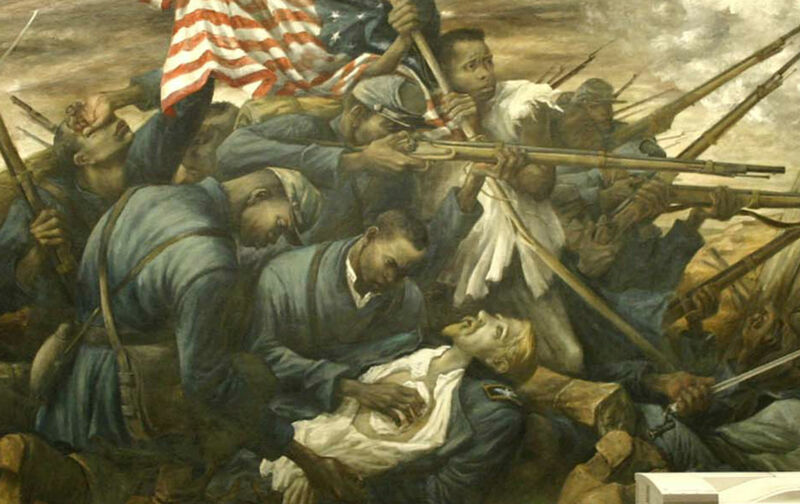 The African American Civil War Memorial & Museum will honor black soldiers who were not welcome at the original Grand Review celebration. By this week 150 years ago, the Civil War was over, the Union preserved and slavery effectively abolished. But there was one more formality needed to officially mark the end of the war: a Grand Review of the Armies in Washington, DC, to welcome the victorious troops home. A century and a half later, their time has arrived. The museum expects about 1,500 Civil War re-enactors to march, including numerous regiments devoted to commemorating the USCT, and the public is welcome to join. Throughout the weekend the museum will host a series of panel discussions (I will be participating in one on voting rights) and oral history workshops for descendants of USCT veterans, as well as a living-history experience on the grounds of a local elementary school believed to be the site of Camp Barker, which was set up by the federal government to house slaves confiscated as “contraband” by the Union army during the war. Choirs from local schools will greet the marchers with some of the same songs their predecessors sang 150 years earlier. The Grand Review must have seemed an ominous betrayal to veterans of the USCT, and some refused to take the insult lying down. Harrisburg, Pennsylvania, a city with a large African-American community (not far from the Mason-Dixon line), hosted an alternative Grand Review in November 1865. Black regiments from Pennsylvania marched from the State House to the home of Simon Cameron, Lincoln’s first secretary of war, who reviewed them as President Johnson had reviewed the white troops in Washington six months earlier. Community leaders, a Pennsylvania historian once wrote, “hoped to use the occasion to build support for extending the suffrage” to blacks. Frank Smith, who was born in segregated Georgia, says he first became interested in the black soldiers of the Civil War as a young organizer in Holly Springs, Mississippi, in the early 1960s, when he was one of the Student Nonviolent Coordinating Committee’s first hires. One day he met a resident whose father had served in the USCT; he had a raggedy old blue uniform to prove it. But because of literacy tests, poll taxes, and physical intimidation, the man had never voted. “It seemed so bizarre,” Smith recently recalled. Like most Americans at the time, influenced by the same kind of distorted historiography that depicted the era of Reconstruction as Northern aggression and folly, Smith hadn’t previously known about the USCT. “It was an inconvenient part of the story for those who wanted to tell us that the Civil War wasn’t about slavery, that it didn’t involve black people at all,” Smith says. Thanks to the Voting Rights Act of 1965, the man Smith met could vote by the time he left Holly Springs.